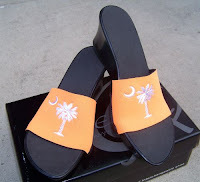 Clemson Girl: ONESOLES shoes from Game Day Divas make great, comfortable game day shoes! ONESOLES shoes from Game Day Divas make great, comfortable game day shoes! 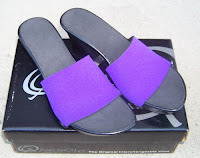 Have you heard of ONESOLE shoes? They are the fashionable black wedge soft-step sole with interchangeable tops – so like the name says, “one sole” and many tops! So you only buy the shoe once, and then you can pick out a variety of tops to match any outfit. Soles come in different heights to fit any lifestyle. These shoes look so comfortable and you can buy the shoes and a variety of toppers on-line or in person this weekend from Game Day Divas. 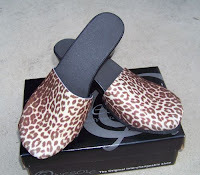 You can also buy clog toppers - so when the weather gets cooler, you can purchase clog toppers for your soles - so cool. So you can really wear these shoes year round! Special Offer for ClemsonGirl.com readers!! Would you like a pair of these shoes with a cute topper for the TCU home game? Buy them online through the Game Day Divas Web site, use the coupon code QONE and get 15% off (valid through Oct. 15th)!! 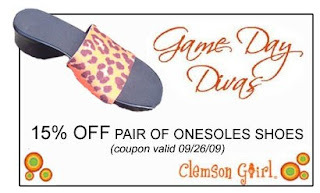 OR… print out this coupon and take it by the Game Day Divas booth this weekend in Clemson (in front of Tiger Town Tavern) to try on and get your very own pair of ONESOLES! These shoes are great for gamedays, as well as traveling, shopping… anything that requires comfy shoes! Change your shoe with a snap! How about a free pair of ONESOLE toppers?? 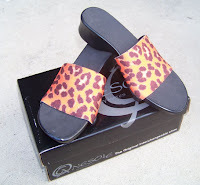 Game Day Divas has told me that they will give the 26th person to visit their booth this Saturday in Clemson (Sept. 26th), and mention they heard about ONESOLEs on ClemsonGirl.com, a FREE pair of the orange, cheetah print toppers!! Game Day Divas rock! If you get a pair of these, please email us and let us know just how comfy they are! Send us pictures of your gameday outfits paired with these fun shoes, and we’ll share them on the blog.